A National Diploma holder of a polytechnic in Delta State, Anene Odikose, has been arrested by the Ogun State Police Command for impersonation. A police uniform, an identity card bearing his name and a Honda car were said to have been recovered from him by operatives attached to the Anti-Robbery Squad of the Agbado division. PUNCH Metro learnt that the team apprehended 31-year-old Odikose on Monday during a stop-and-search at a checkpoint on Matogun Road, Oke-Aro, in the Ifo Local Government Area of the state, where he lives. 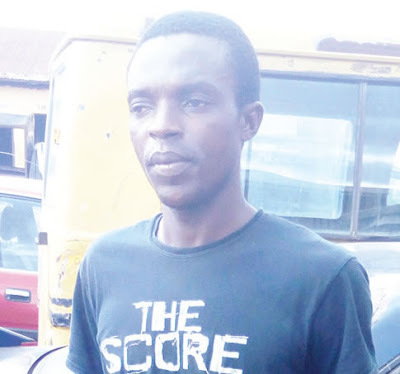 The suspect, who hails from Aniocha North, Delta State, had reportedly hid under the Force to defraud and harass unsuspecting members of the public before luck ran out on him. In a chat with our correspondent, Odikose said he was dismissed in 2011 while undergoing training at the police college in Rivers State. He said the shame of returning home made him to approach a police friend, who assisted him in obtaining the uniform and the ID card after he paid N500. He said, “I am an ND holder in Business Administration. I was enlisted in the police in October 2011. During the 15-month training at the police college in Rivers State, some officers came from Abuja to screen us. Unfortunately, I was dismissed on the grounds of physical fitness. “When I left the college, I was shy to go back to the village and tell my people that I had been disqualified. I went to live with a brother in Asaba (Delta State). Odikose, however, denied using the ID card and the uniform to commit crime, saying he only tendered the ID card at checkpoints to evade police interrogation whenever he drove out his car, whose documents were incomplete. “I came to Lagos in 2014. I was working as a security guard and a driver around Isolo (Lagos State). I got the ID card to avoid being intimidated on the road when I am driving. I have never used it to commit crime. I am a focused person. It was very unfortunate that I find myself in this kind of situation. “I had never shown the ID card to policemen until that day. All I want is mercy. I have two children and a wife to fend for,” he added. The Ogun State Police Public Relations Officer, ASP Abimbola Oyeyemi, said the case would be charged to court after investigation. He said, “At about 10.50am, a team of anti-robbery policemen on routine patrol around Oke-Aro, Matogun area, intercepted a Honda Civic with number plate, BW891LSR, driven by the suspect. He identified himself as a serving policeman and presented a Nigeria Police Force constable warrant ID card. On interrogation, it was discovered that he was a fake policeman.